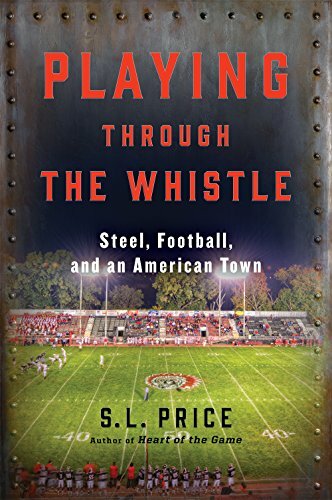 Playing Through the Whistle captures the story of Aliquippa, a small city of just over 9,000 people in western Pennsylvania, not far from Pittsburgh. The driving force behind its growth, which reached 27,000 in 1940, was the Jones and Laughlin Steel Company. As author S. L. Price notes, although it would never be a U.S. Steel or Bethlehem Steel, by the late 1930s J & L's Aliquippa Works was one of the largest integrated steel mills in the world, and Aliquippa had become the largest steel company town in the United States. Although Price is best known as a senior writer at Sports Illustrated, covering everything from tennis and the Olympics to college basketball and the NFL, he is carving out a niche for himself with a series of books that examine sports stories in the context of the people and places in which they take place. In Pitching Around Fidel: A Journey into the Heart of Cuban Sports (University Press of Florida, 2014) he examined the Cuban sports machine in the wider context of the economic and social decline of Castro's regime. Five years earlier, in Heart of the Game: Life, Death, and Mercy in Minor League America (Ecco, 2009) he wrote about the heartbreaking death of minor league baseball coach Mike Coolbaugh and what it meant to small-town sports and small-town lives. Playing Through the Whistle narrates the story of Aliquippa from the turn of the 20th century through its many iterations as a rigidly controlled company town, a booming racial and ethnic melting pot, and a battleground for union rights. Extremely well researched and supported by myriad interviews of past and present townspeople from all sides of the story, this book is a remarkable documentation of the rise and decline of a typical rust belt town. Wondering where the football comes in? But football fans buying the book with the expectation that they will be reading all about the growth and development of one of America's most notable high school football programs, with names like Mike Ditka, Tony Dorsett, Ty Law, Darrelle Revis, and Jonathan Baldwin heading the honor roll, must understand that sports comprises only one of the layers competing for attention in this comprehensive study of Aliquippa's social development. As we learn, Aliquippa also produced composer Henry Mancini and other notable celebrities, along with thousands of ordinary citizens living ordinary lives. When he focuses on the high school football Quipps and their up-and-down fortunes under legendary coaches Carl Aschman and Mike Zmijanac, Price brings us all the grit and mud and roller-coaster emotions of melting-pot, steel-country high school football. It's great reading for every football fan, when he gets around to it. And the extensive quotes from Ditka, Dorsett, Revis, and others make it that much more interesting for aficionados of the game. But the book has a much wider focus than football, and the title could be fairly said to refer much more to the factory whistle than the one in the referee's pocket. Michael J. McCann is a New York Journal of Books staff reviewer.